April 10, 2017, we posted a story titled “What If?” that asked questions about the oddities that surfaced in and about Hillary Clinton’s actions during her 2016 presidential bid and probable outcomes if she had taken different actions. Today, our approach is to really ask “What If?” questions, and ask you to consider for yourself some real differences in thinking, talking points, and actions. Let’s go! What If… Nancy Pelosi, Chuck Schumer and other Democrats would initiate or participate in a conversation (or debate) about the truth of border walls elsewhere in the world, their successes or failures, and discussed objectively the facts given by experts regarding circumstances at the southern border and what such a wall could do or could not do to address illegal immigration? They have both (as have most Democrats) acknowledged there is a problem there. But there have been no substantive discussions or debates with an honest intent to resolve the problem, nor have there been meaningful discussions about facts, for that matter. What If… Leadership in the Democrat Party, instead of non-stop bashing of everything regarding governmental issues of all types offered by the President or other conservatives, present to all Americans THEIR suggested alternative policies, programs, and show the benefits of THEIR ideas that eclipse those of the opposite side? Honestly, such a suggestion goes to the fact that in Americans in great number have no idea what the Democrat Party offers Americans or what the Party supports, other than pro-abortion, anti-gun, and Medicare-for-all ideas. What If… Supreme Court Justice Ruth Bader Ginsburg’s physical condition and age result in either her recusal or retirement from the bench? It is pretty certain a conservative candidate would be nominated to take her place. If that happens, it is certain we would be destined for an even more Creetin war between political parties than we saw during the Kavanaugh confirmation process. What if opponents of this President’s Constitutional duty to appoint a SCOTUS replacement go so far as to make legal challenges against the President’s authority to do so? What If… California voters knew that a group of California lawmakers took a trip to Hawaii with utility companies last year as wildfires wreaked havoc in their state? And that during the junket, representatives from utility companies discussed with lawmakers just how much responsibility they should bear for wildfires – even as Pacific Gas & Electric Co. (PG&E) could be on the hook for several billions of dollars in damages for fires it caused over the past few years. The utility companies are pushing for a new state law that would raise electricity prices to offset costs incurred from wildfires. What If… Rank-and-file Democrats knew what a “superdelegate” is and that those gave Hillary Clinton the Democrat Party 2016 presidential nomination to Hillary over Bernie Sanders? A Superdelegate is a Democrat Party delegate who is seated automatically and chooses for themselves for whom they vote. These Democratic Party superdelegates are free to support any candidate for the presidential nomination, regardless of the wishes of Democrats who voted for them strictly because of those delegates’ commitment to a specific candidate. What If… Those same rank-and-file Democrats go all-in in 2020 for Socialist candidates and their agendas — like House Representative Alexandria Ocasio-Cortez (D-NY)? Doing so would obviously send the U.S. Government far to the left — farther than even some of those Socialist governments in Europe, like the U.K., Germany, France, and others are. What If… Democrats joined Republicans to demand law enforcement from the Department of Justice top-down and begin the universal enforcement of ALL federal laws regardless of the laws or the offenders? If so, such enforcement would necessarily include lawbreakers like violators of immigration and federal drug laws. What If… Congress would suspend the current policies regarding government spending that guarantee the continued ramping up of U.S. debt? What If they refused to pass any spending bill without Congressional Budget Office’s rating at budget neutral before voting up or down on the measure? What If… Congress suspended the practice of taking favors of any kind from formal or informal lobbyists — PERIOD? That would require changing federal laws to ban such actions. It would need to be crafted to be “chat-proof,” for current laws contain multiple loopholes that allow lobbyists — even though forbidden for lawmakers — can provide lawmaker family members to receive lobbying goodies like college scholarships, cush jobs, and other secret benefits. What If… Congress actually banned lobbying? Think about it: companies that fund lobbyists and their firms’ connections on the Hill to directly or indirectly impact bills under consideration to impact such consideration in the favor of those companies. Such companies would be forced to sell their products, services, and concepts only through conventional methods that would legally preclude any type of existing lobbying benefits given to members of Congress or others with which they are connected. The above are thoughts about critical elements involving our government. But what is front and center today and cry for answers are “What Ifs” about this President and everything he stands for. Never before in recent history is there an example of such vitriolic hatred for any United State President. What is most troubling is the appearance that many on the left — led by a militarized Media — have NO intention to in any way have open, honest, and civil discourse with Donald Trump or those in his administration or even Congressional members of the other party. What If… President Trump stopped tweeting? What If… Congress subpoenaed Robert Mueller to (in closed session) testify under oath regarding details discovered in his investigation that prove the wrongdoing of President Trump regarding Russian collusion during the 2016 election cycle? What If… President Trump did away with daily White House press briefings and instead started a White House YouTube channel? What if he weekly published a press briefing in which he spoke to Americans directly and contained in each would be answers to a bunch of questions submitted through the White House press office in advance of those broadcasts? What If… The President ordered his Department of Justice to reopen the Hillary email investigation, had Hillary Clinton “officially and under oath” answer questions she should have been asked by Comey, and taking the same testimony from James Comey himself, former Attorney General Loretta Lynch, and former President Bill Clinton? What If… The President requested the federal attorney for Washington D.C. to process the criminal referral made by Congress of former Attorney General Eric Holder for failure to appear when subpoenaed — the first AG in U.S. history to do so? What If… President Trump insisted that the DOJ take criminal actions against all those who have violated federal laws regarding the unauthorized release of classified documents and information? What if those actions were taken against former President Obama who clearly broke those laws in his use of a secret Gmail email address he used in communication with then Secretary of State Hillary Clinton on that unsecured server that was not examined and authorized by Department of Justice IT specialists, which is required under law? 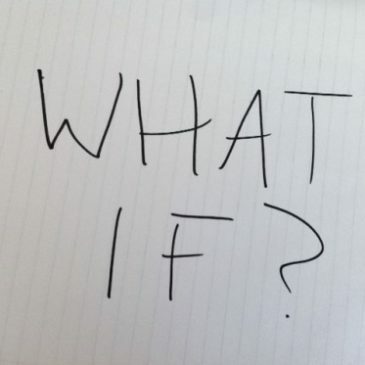 We could go on and on all day and begin numerous conversations with a bunch more “What If’s.” But doing so would probably be futile. Why? Nothing we can say, ask, or do at this point makes any difference in the madness that is escalating every day in Washington. The Left is simply out to get this President! Don’t get me wrong: if President Trump or any member of his campaign or administration violated any laws in anyways, they should each be prosecuted for their crimes. That applies to ANY who have served in government — even former President Obama, Hillary Clinton, the disgraced former members of the DOJ and FBI, former National Security Advisor Susan Rice and former U.N. Secretary Samantha Powers. No one is above the law: NO ONE! I’m not a politician or a political expert. But what I am is an American citizen who as best as possible does and has always obeyed the law, paid taxes, owned a company with many employees who provided goods and services to other Americans, a husband, father, grandfather, and a Christian. To some, all those things I am are black marks against me. And the fact that such is true is simply a travesty. Where has the simple goodness of being American, loving and respecting our country, obeying the law and expecting everyone else to do the same gone to? Are we no longer a nation of laws? Are we no more a nation with a government “of the People, by the People, and for the People?” Is the United States no longer the richest, strongest, and greatest country in World history? Is this country no longer where one is innocent until proven guilty? Do our laws no longer apply to everyone? In the opinion of this writer, what we are watching is the frantic throes of frantic people who are angry for two reasons: one, they cannot believe a rich kid from Queens who is rough and brash and non-traditional and non-political could possibly run this country and be successful in doing so! They refuse to accept that the economic leaps the U.S. economy has made, the multiple victories in foreign trade and relationships with the leaders of foreign nations, the massive personal and corporate tax reductions, the tens of millions of new jobs, the lowest unemployment numbers in recorded history in every sector, and the most dollars ever collected by this government even with those tax cuts could be possibly due to that red-faced guy from New York who doesn’t act like a politician. Secondly, he beat the person that THEY had anointed to continue the policies of the first President in U.S. history to espouse “Socialism Lite” in his policies that summarily began the dismantling of the nation’s economy and infrastructure. HE BEAT HILLARY! And for that, HE MUST BURN! Don’t be shocked if Donald Trump is impeached. Don’t be shocked to hear and see more unsubstantiated stories are released about alleged wrongdoing by Candidate and President Trump. The Washington Post and New York Times stories referenced above have already been debunked with facts. And neither of their stories gave the sources of the information reported! ← Is It A National Emergency at the Mexico Border?